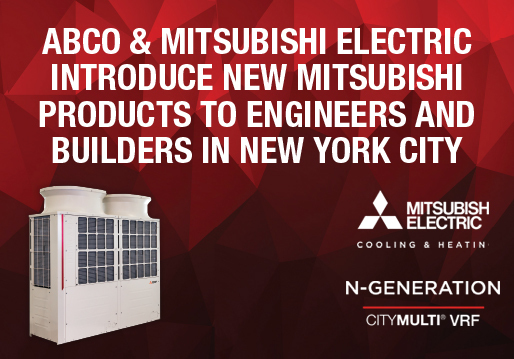 Mitsubishi introduced several of Mitsubishi Electric’s new advanced commercial systems to greater New York area engineers, architects and builders at The Standard Hotel and at the EXPO. Executives from Mitsubishi Electric and ABCO Expertise & Resources (AER) unit unveiled The CITY MULTI® N-Generation outdoor unit, an advanced VRF system and its smaller footprint package. This latest, new generation offering is designed to maximize energy efficiency, improve flexibility and increase performance. Expanded vertical piping limits – up to 295 feet to increase building design options. Mitsubishi’s new Diamond Controls™ panels that provide unparalleled management oversight to many Mitsubishi commercial projects were also detailed. New benefits include improvements in Advanced Integration, System Automation, Energy Management, Custom Applications and Centralized Control. Real-world examples of how Mitsubishi Electric and ABCO AER are partnering to implement the economic and environmental benefits of Mitsubishi systems include: the massive Cornell Tech campus development on Roosevelt Island; the Statue of Liberty Visitors Center; the Dakota Apartments; the Nike Soho flagship store; the Integate. Manhattan Building. Mitsubishi’s new high heating Hyper-Heat PUMY Series was also introduced at the ABCO AER event, along with a new generation of standard PUMY’s with lower electrical requirements. CITY MULTI S-Series: PUMY is the all-in-one air conditioning solution for large residences or light commercial applications. (3 – 5 tons).